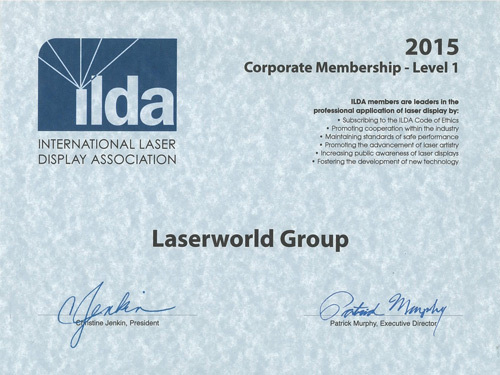 The ILDA (International Laser Display Association), founded 1986, is a worldwide acting non-profit organisation consisting of companies, institutions and persons. ILDA is dedicated to advancing the use of laser displays in art, entertainment and education. ILDA promotes the use of laser displays through an annual award program, publications on recent laser topics, technology standards etc. The ILDA Assosication informs potential customers as well as users of laser display systems about the correct operation, current technology standards and further topics. Additionally ILDA represents the laser display industry on safety issues and provides a forum for members to discuss problems, exchange ideas or to explore new technologies. Laserworld is an internationally established company. As such we endeavor to be in accordance with high quality and safety demands. Therefore it is essential to be informed about technical innovations , technical standards and their guidance constantly and to work together with partners and associations as the ILDA.